Dips and Spreads | Naturally. This is one of my favorite parts of my pantry. It’s a variety of flavor enhancers, dips, and overall fun recipes (and they all can make an awesome addition to grilled cheese sandwiches or quesadillas). There’s a lot of room for homemade versions of these dips and spreads. But it’s also a great opportunity to look for small-batch producers in your area. If you’re in the market for the perfect addition to roasted vegetables or a nice topping for other dips, harissa is the way to go. Traditional Tunisian harissa is a hot chili pepper paste that uses roasted red peppers, hot chili peppers, various spices, and garlic. I typically use harissa paste but you can also buy a dry spice rub. 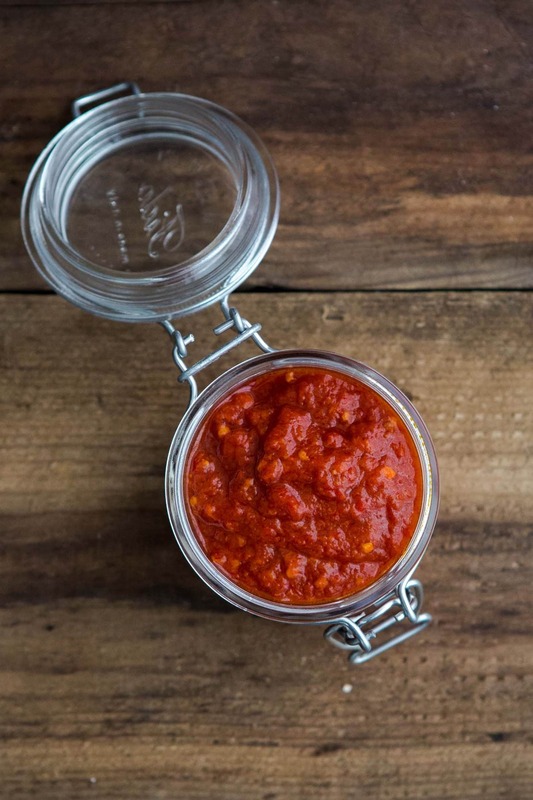 Harissa can be purchased pre-made or your can easily make your own at home, which I prefer so that I can control the heat. I also find the flavor is better. I make a mild version with roasted red peppers but a variety of chili peppers can be used to turn up the heat. I like to use harissa with lentils, as a topping for soups, or even as a spicy spread for grilled cheese sandwiches. I keep harissa with a thin layer of olive oil on top or freeze small portions to use as needed. While hummus originated in the Egyptian region, it’s become a staple in diets around the world. It is a simple chickpea dip at its roots. There are endless variations and ways to make it, but true hummus has a chickpea base. Most recipes use chickpeas, tahini (sesame paste), lemon juice, olive oil, and garlic. There are many methods of preparation and ways to make the hummus smooth but I prefer the easy way: puree everything in a food processor. I always have a container of hummus stashed in the refrigerator. It’s the perfect snack, a wonderful addition to an appetizer plate, and I especially love it with grain bowls and on grilled cheese. 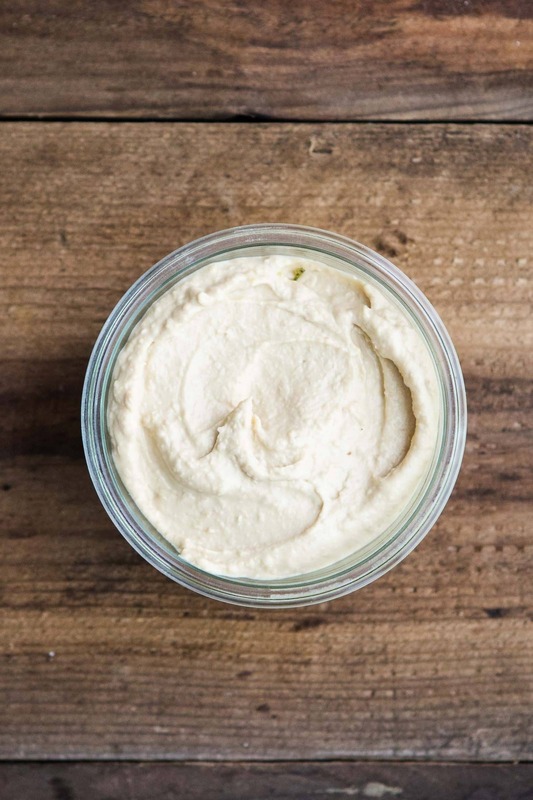 You can purchase hummus in nearly every store but it’s easy enough to make at home. I recommend keeping a jar of tahini on hand for when the mood strikes. Hummus will last just under a week in the refrigerator. Hummus can be frozen but I don’t recommend it as the flavor and consistency is never the same as fresh. It wouldn’t be a list of spreads without including jam. I prefer jam over jelly because it contains chunks of fruit and feels less processed. Jam is typically made from fruits with a bit of sweetener, citrus, and pectin (for a more cohesive spread). I prefer to keep the ingredients simple in jams and let the fruit shine. Jams can also be savory (such as onion jam) but I usually stick with the fruit versions. 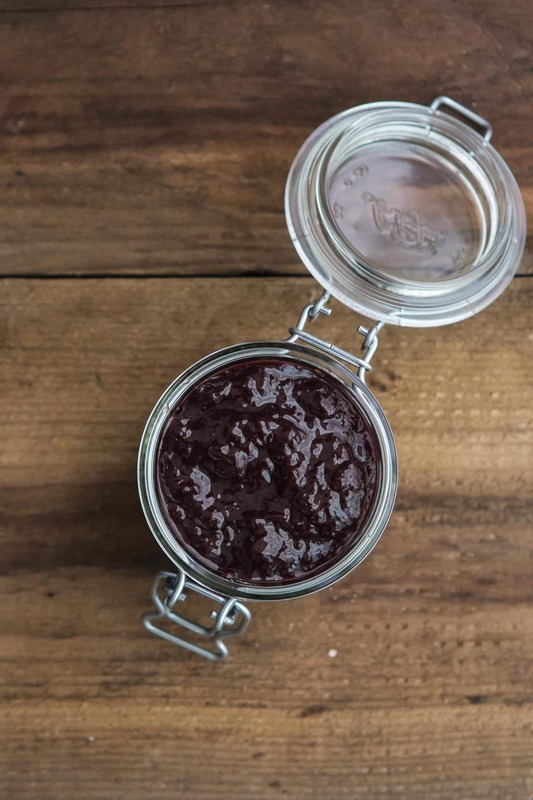 I keep jam on hand for toast, to swirl in to yogurt, and as a topping for morning oatmeal. Jam is also a good candidate for canning, if you find yourself with too much fruit during any given time of the year. Jam will keep for quite a few months in the refrigerator, just be on the lookout for mold. Pesto is a staple in my kitchen. I grow at least three basil plants every summer just so I can make pesto throughout the summer. I also freeze pesto so that I can have some throughout the winter. Pesto has a simple list of ingredients (basil, pine nuts, parmesan, olive oil, garlic, and lemon juice) processed together. It’s easily made with a blender or food processor. Pesto is a versatile ingredient. Use it in pasta sauces, on roasted/grilled vegetables, as a spread for grilled cheese, or as partner to eggs. 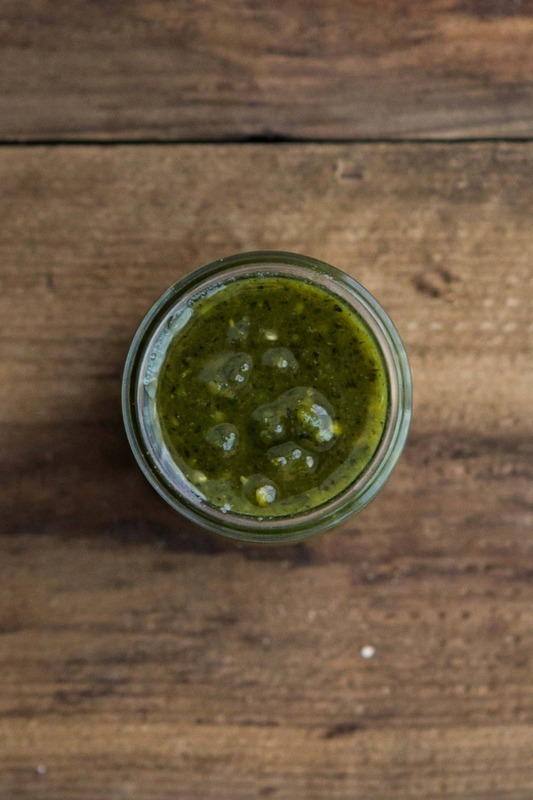 You can also change up your pesto (a great way to get around if you don’t have a ton of basil). I’ll often throw in other leafy greens like spinach or kale and switch out the pine nuts for almonds or sunflower seeds. Homemade pesto will last up to a week in the refrigerator and several months in the freezer. I could write a book about salsa, given the plethora of variations and ways to use it. Salsa is a generic term for sauce in Italian and Spanish but for me, salsa is the familiar tomato-based chip dip that lines the grocery store aisle next to tortilla chips. Other variations I make include tomatillo, mango, rhubarb, or zucchini based salsas. I use salsa beyond it’s dip capability. It’s a great topping for egg skillets, grain bowls, or homemade nachos. Canning a roasted tomato version during the summer keeps me through the winter. There are also endless amounts of store varieties to choose from as well. 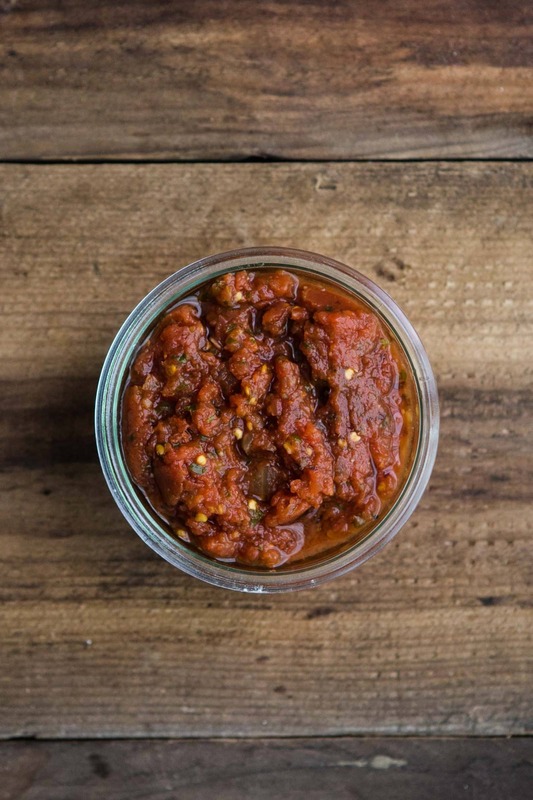 I like trying different small-batch producers as I find they tend to have more flavor than the generic salsa. Homemade salsa will keep around 5 days while store-bought salsas will last a couple weeks (or more).